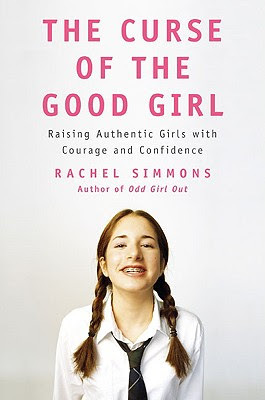 Shortly before the big move, TLC Book Tours contacted me about reviewing The Curse of the Good Girl by Rachel Simmons on my blog. My first inclination was to say, "No, thank you. Too much on my plate right now." But then I read the book's description and, as a mother of girls, I thought I shouldn't pass up the opportunity. When Joel and I first turned the key in our new home, the book was already waiting for me to begin reading. As I started reading the introduction, I began to worry that this book would be a little too feminist for my tastes. That the ideas contained in its pages would teach girls to be selfish and mean and only concern themselves with their own feelings. What about compassion and service and selflessness? What about kindness and respect? But then a particular passage struck me, and I was on board with the idea. "There is nothing wrong with being a nice person, nor is it my intent to undermine the unique sensibilities of women and girls. But girls need to have the tools to say no, to ask for what they need, and to say what they think. Too many girls and women walk away from conversations muttering to themselves about what they really wanted to say. When kindness comes at the expense of truth, it is not a kindness worth having. And when generosity leads to silence or abuse, it is not a generosity worth giving." So I kept reading, and to my horror, I discovered that I myself am what Rachel Simmons calls a "Good Girl." (So horrifying, right?) I began to realize that much of the inner angst I put myself through is because I feel like I shouldn't be feeling a certain way, so I don't allow myself to feel whatever emotion it is I shouldn't be feeling, even though I am feeling it so I just bottle it all up inside until I have PMS and it all comes screaming out. And then I can just blame PMS. It seems so logical--almost too logical--that instead of keeping it all in, I should instead learn to communicate how I am feeling to the people I love most. And that's just the beginning. Good Girls are afraid to take risk. Any hint of criticism causes them to fall apart. They are afraid to ask for what they need, instead just hinting or expecting those around them to be mind readers. They can't stand it when somebody doesn't like them. They are afraid to have an opinion, because it might differ from someone else's opinion. Like I said, it all was horribly familiar to me. I am the poster child for being a Good Girl. I figured I ought to try some real-life application of some of these principles. The book gives some excellent role-playing situations where mothers can help their daughters learn to understand and deal with their emotions in a healthy manner. I do plan to use these ideas with my daughters, but my real-life application had to be for myself. To see what happened to my Good Girl mentality when I personally used some of the principles I had read about. So, after a big move which caused much stress on me, I had definitely been bottling more emotions than usual. I pretty much had a year's supply. I was feeling annoyed with my husband, and that annoyance had quickly morphed into all out anger. Anger that I wasn't supposed to be feeling, so I pretended not to be. In the end, I sat down and wrote him an email about the way I was feeling. The results were amazing. He came home from work, having read my email, and we talked (civilly) for a long time and guess what? He wasn't mad at me. We came up with solutions together. He actually understood where I was coming from because I stayed calm and explained what I was feeling and why, instead of blowing up when I finally couldn't take the negative feelings anymore. With all of that said, I still feel that the author sometimes took things a little too far. I would have liked to see a point of view that was more religious, and how to find a balance between the things I am taught in order to be more Christlike, and the things that I need to do to be emotionally healthy and confident. Definitely a good read, especially if you have teen-aged daughters, or daughters who are rapidly approaching adolescence, like I do. It's a quick first-time read, and then can serve as an excellent reference book afterwards. Thanks for your review of this book. It sounds like me too! I will have to get a copy of this book and read it. There is so much truth to that excerpt. And there doesn't need to be a fine line between feminism and speaking your mind. I wish I spoke my mind less often. That I simmered on things longer before blowing up. I can be so hot headed sometimes. It's one of those balance issues. We need both sides I guess. I used to be a lot more of a good girl than I am now. But I definitely still find myself holding my tongue a lot, so that I can be nice. last week I was invited to an online discussion lead by the author of this book...I declined the invitation solely based on the title of the discussion "The damage we do to our daughters by teaching them to be nice, polite, and self-less." I'm glad to hear that she ultimately wasn't saying women shouldn't be nice, but that they need to learn to be honest. Without having read the book, I think I would have the same issues as you, figuring out how to meld the ideas with what I've been taught about being Christlike. Ultimately, its more important to be Christlike than a worldly person's version of a strong woman. But women in general could sure use a good dose of self-esteem, and self-esteem is definitely not developed from muttering under our breath, settling for the leftovers, or bottling up anger until we embarrass ourselves when we blow. I have never bottled up how I am feeling and then blown up on hmmm say MY BLOG :-). It sounds like I should check out the book as well. I think the key to finding the balance between self-preservation or care and self-sacrifice and service is one of the greatest ones faced by women. I haven't read that, but it sounds really good. I was more of a good gorl years ago, but through certain life experiences, mostly just living in LA and some other innocuous things, I have learned to be "kindly honest". Good food for thought. Thanks, Lara. That paragraph right after "Wow" gave me the giggles...reminded me of an Abbott & Costello routine. So true ! Interesting. There really is a fine balance. I think I'm not too much of a good girl (I don't care what people think of my opinions or feel crushed if they don't like me, but I'm not good at asking for help and I'm not good about expressing my emotions) but this is all very interesting to think about. Thanks for the review. This is something my sister and I have been talking about recently--how especially in the LDS culture we get this idea that being a "good woman" means being a doormat or not speaking up or giving up what we want just because it's "nice" to do that, when it's not necessarily the right or just thing to do. Sounds like the underlying concept of this book is good. I may have to check it out. It sounds very interesting. Emotions are such a tough thing to balance. I'm definitely for wanting my kids to have good self esteem, but I also don't want them to get it by putting people down. Which, it seems happens often if you speak your mind without regard for others' feelings. Does that make sense? I think the important thing must be learning how to stand up for yourself in a Christlike manner (as you mentioned). These are all things I have been thinking about lately. It does seem a bit hard to find the line between standing up for ourselves and being kind. But like I've said on my blog before, being Christlike doesn't mean being a pushover. Good thoughts. Andrea: One thing I didn't mention in my review, is that Good Girls are the ones who turn into mean girls. It's the Good Girl mentality that causes all of the put downs and such. So, essentially, if we teach our daughters to deal with their emotions in a healthy manner, they shouldn't let it get to the point of putting down others. That's what the girls who don't know how to deal with things in a healthy manner do. Does that even make sense? Lots of great stuff in this book, I couldn't even begin to cover it all in a review. They always say to aknowledge the feelings -- be OK with feeling them. Makes sense. It's not OK to turn into a freak about the emotions, but you have to realize you FEEL that way, and then deal with it approriately. Wow. I DON'T have any daughters, but I might need this for me! Wow!! Sounds just like me!! I will have to get my hands on this book. Thank you so much for sharing this. I am working towards getting my life and health insurance license, and I just can't get my brain to soak in the information. I could be making a lot of $$. Enough, so that my husband can stay home and we would still make more than what he makes. Why am I holding back? Why can't I just learn the information??? This totally makes sense to me. Now that I know what the "real" problem is, maybe I can go forward. I'm in the process of Good Girl turning to Real Girl. So far, I've had mixed results. Some people don't care for change, you know? Lara, your review brought tears to my eyes. One thing I struggle with is telling my husband how I really feel, and not just stuffing it away until I can let it out when I watch a sappy chick flick. While I wasn't necessarily brought up to be a Good Girl, I wasn't taught that while talking about your feelings can be uncomfortable, it's really very important. Wow! I would really like to read this book. Thanks for a great review! Oh wow ... yikes ... yes, I totally relate to those ... I am going to need to get that book - thanks for taking the time to review and share. And thanks for your "visit" today ... welcome back to Utah! 'Good Girls are...' Yeah, that is me all over. Or at least it was at one point, and I still have strong tendency's to do that. I've learned how to ask for what I need and am improving on talking when it matters. Criticism and opinions are still big weaknesses for me. But I'm improving. Jeff has helped a lot. That book sounds wonderful! I am going to have to add it to my list of books I am going to read for my children. Also Reviving Ophelia: Saving the Selves of Adolescent Girls is another book. I haven't read it yet, but my mother and sister both have, they rave about how great it is, especially in helping girls not want to grow up too soon. Just saying if you have time. Thank you so much for visiting my blog. I love making friends! I have a hard time expressing my feelings. I do not want my daughters to follow that example. Although it may be polite, it is not always healthy. I have to check this book out. i don't have any daughters, but this still seems like a good read. Wonderful review. I have pre-teen daughters and it's important to me that they learn to express themselves in a healthy way. Sounds like a great book. Thanks for being a part of the tour! I have to share this - I meant to post about this back when you posted this entry - the part you bolded - SPOT ON! With the whole "childrens artwork program debacle of September 2009", my bishop said he was so happy that I was able to speak my mind and be direct, because too many people are just nice and nod and walk away muttering and saying what they really feel in other circles. He appreciated that 'real' part of me and that I was willing to speak my mind and feelings about it. Funny how that attribute causes trouble for me and is seen as a positive. I think I'm going to read this book. It is also good to have around with me teaching high school in a school with various religions and ethnicity.